Peeps, 20x40, 2006, Photo by permission. Gummy Worms and Tums, 20x40, 2006, Photo by permission. Eat Me Daily: So, why candy?... and pills? 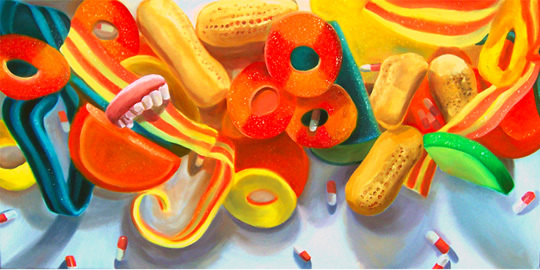 Vanessa St. Laurent: I paint candy because it's beautiful, I love it, and I never get tired of looking at it. I also like how something so typically, fun and simple can be seen in a much darker light such as a candy vortex, a gluttonous mess of sugar, or as something sexual. Sometimes it’s nice to make a piece that’s totally decorative and straightforward, but more often than not I am drawn to painting images that are fun and simple at first glance but quite f*cked up or surprising if you really look at them. It is difficult to articulate exactly why I paint pills. Childhood memories might subconsciously be influencing my choices. Candy and pills/medications were both a big part of growing up at my house and I relate the way I eat candy to the way I used to see my Mom taking pills. 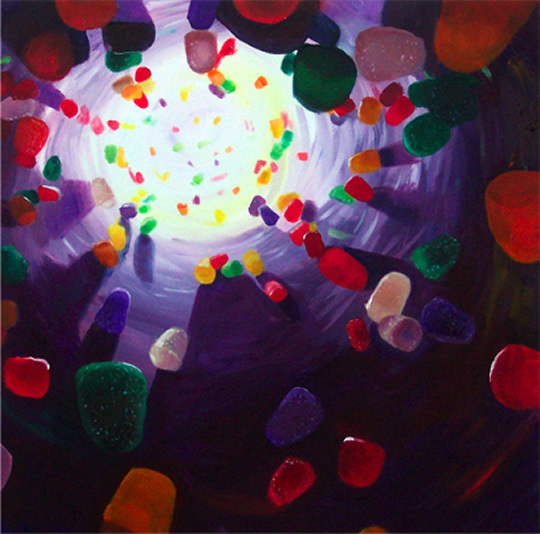 I began painting candy in 2005 when I had to stick with consistent subject matter for a year. Candy was the only thing that could hold my interest for an extended period of time. Were you inspired by color? YES I am inspired by color wherever I see it. Bright colors turn me on and I feel most comfortable when surrounded by bold, intense shades. I feel dead and sort of invisible without them. Circus Peanuts, 20x40, 2006, Photo by permission. 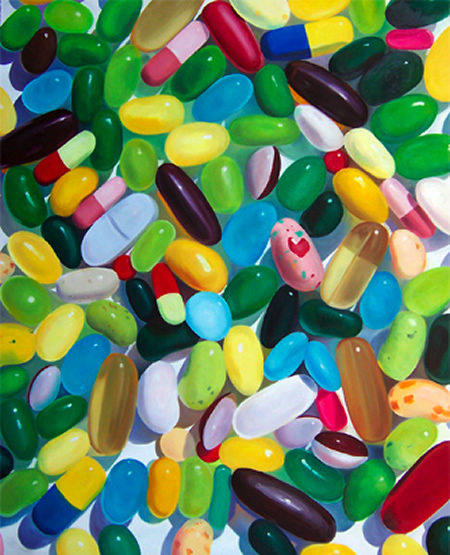 Jelly Beans and Pills, 60x50, 2006, Photo by permission. 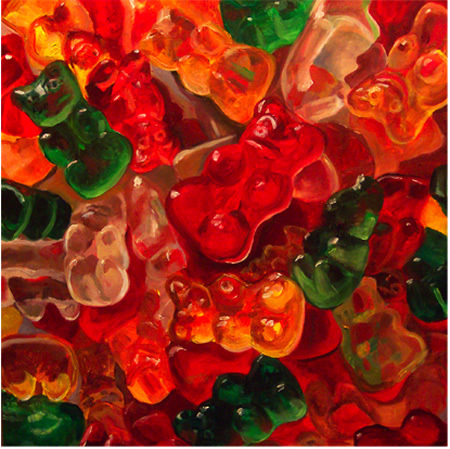 Gummy Bear Pig Pile, 18x18, 2007, Photo by permission. 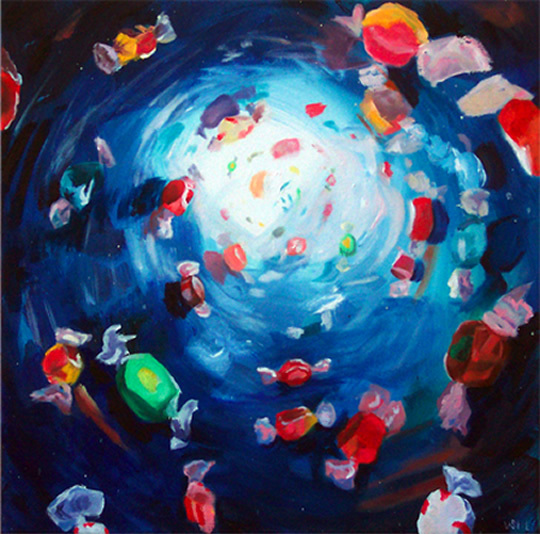 Taffy Vortex, 21x21, 2007, Photo by permission. Gumdrop Vortex, 20x20, 2007, Photo by permission. Mike & Ike Vortex, 15x20, 2007, Photo by permission. 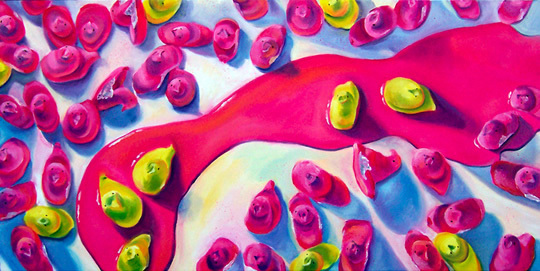 Lollipops, 15x30, 2006, Photo by permission. St. Laurent's work is currently on display at the "Eat the Art" exhibit at the Bunker Hill Community College in Boston. Her work is also available for sale by contacting her through her website.